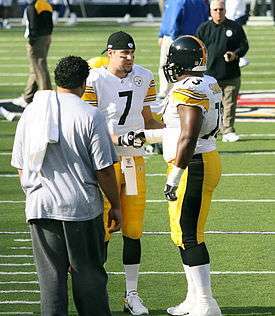 Simmons (right) talks with Ben Roethlisberger prior to a game in 2006. Henry Alexander Kendall Simmons (born March 11, 1979 in Ripley, Mississippi) is a retired American football guard. He was drafted by the Pittsburgh Steelers in the first round of the 2002 NFL Draft. He played college football at Auburn. He has also been a member of the New England Patriots and Buffalo Bills. Simmons grew up in Ripley, Mississippi. He was a three-year starter at Ripley (Miss.) High, where he was named an All-State and PrepStar All-America selection as a senior defensive lineman after a season when he recorded 70 tackles and four sacks, forced five fumbles and returned one for a touchdown. Simmons was named District Defensive Most Valuable Player and was voted Clarion-Ledger "Top 10" and No. 2 offensive line prospect in Mississippi. He was a Commercial Appeal "Mid-South Top 100" and was chosen to play in the Alabama-Mississippi All-Star Game. He also played baseball and basketball. Before the 2003 season, Simmons was diagnosed with type 1 diabetes. Simmons started the first two years of his career. After being hurt all of 2004 he came back in 2005, and started all 20 games and won Super Bowl XL with the Steelers. Simmons experienced an off-the-field injury during the 2006 NFL season. While rehabbing a heel injury, Simmons suffered a frostbite-like burn to his left foot after he fell asleep with a cooling device attached to his foot. On September 3, 2007, Simmons signed a four-year extension with the Steelers, keeping him with the club through the 2010 NFL season. Simmons suffered a season-ending injury to his Achilles tendon during a Monday Night Football contest against the Baltimore Ravens on September 29, 2008. He was subsequently placed on season-ending injured reserve. He was released by the Steelers on February 26, 2009. Simmons signed a three-year contract with the New England Patriots on September 6, 2009 and was released on November 6, 2009. Simmons was signed by the Buffalo Bills on November 24, 2009. On December 18, Simmons was placed on Injured Reserve due to a shoulder injury. He announced his retirement from football in 2011, and now lives in Auburn. ↑ Cumbow, Victoria (September 6, 2011). "Auburn Great Kendall Simmons is Full-Time Diabetes Advocate". War Eagle Reader. Auburn. Retrieved 3 February 2015.